The one match that's so far set is against Nikoloz Basilashvili. I've only ever seen glimpses of him play and you only need to type his name into YouTube to see there's very little footage of him. He did however make the Third Round at Wimbledon last year, won a couple of challengers and came through qualifying at the US Open so he has at least some experience at slam level. Roger has never played him before, in fact it will be Basilashvili's first match against Top 10 opposition, and I think Fed will come through that one comfortably. Round 2 is a potential tricky encounter against Dolgopolov. The Ukrainian is used to being a seed at the Slams but has slipped down into the mid thirties in the rankings. He's a much better player than that though and on his day can trouble anyone. Roger handled him easily in their last encounter in Indian Wells 2 years ago and you'd have to back him to come through again here. Straights most likely but Dolgo is more than capable of getting a set. Dimitrov then looks most likely to make the third round, facing Paulo Lorenzi who has only won 2 matches in 20 attempts at Grand Slam level in his opener then a qualifier in Round 2. If their Brisbane match is anything to go by then it could be a tough one but I think Dimitrov played above his level and Roger below his in that one so Fed is the favourite. Could be interesting but Fed holds most of the aces in that matchup. The Round 4 seeded opponents are either Goffin or Thiem. I think Leonardo Mayer has a good chance to come through that section though. Thiem retired in his last match in Sydney so I'm not sure on his fitness and Goffin's lack of firepower or serve means he gets turned over quite a lot by players ranked much lower than him. Should Roger get himself into the second week the first big test, on paper at least, will be in the quarters with Berdych, Cilic and Kyrgios all in the mix. Any of those guys could come through that section and Bautista-Agut also deserves a mention as his solidity over 5 sets wins him a lot of matches. Into the semi finals and this time it's Djokovic in the same half. His record in Australia is imperious so you'd have to be confident of him getting there. Tricky first round for him facing Chung who is an up and comer but you can't see him running into issues. Final is then anyone's guess – Murray is the seed, Stan is in that section and Nadal too so it's wide open. As usual it's just 1 match at a time, last year saw Roger struggle vs. Bolelli then crash to Seppi so the first aim is surely to better his 2015 performance. I think he looked pretty good in Brisbane before playing the lacklustre final so I'm backing him to make the second week. Nadal to straight set Verdasco, I hope it's like 2009 though. What do you guys think of the draw? Let me know in the comments. Live chat will be running as usual for all matches so I'll see you guys on Monday or Tuesday for his first match. And finally Tiger Mobiles are again running their tennis bracket game for 2016 and there is also the peRFect Tennis Mini league which you can join and I'll give a prize to the winners after the Paris Masters. 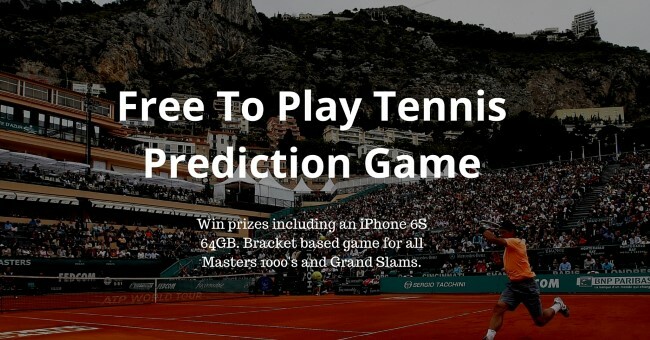 The prizes on offer from Tiger Mobiles are different this year and for Slams you can win an iPhone 6S and for Masters 1000 a 1 year subscription to TennisTV. Can’t believe it! The Twitter feed said 36 seconds, and Nambi already in before me! It is perfectly ok to admit you were stalking me. Hmm, a couple of qualifiers in Roger’s little bit of the draw, one of whom might mess things up a bit (they play each other in the first round. Lucky things). “Tricky” for Novak means being pushed to 3 sets, maybe one or two of them tight-ish, so I don’t think I’d have any worries on that score. Let’s see if Roger gets anywhere near his scheduled place in the draw before we start thinking about that, though. I just hope he’s sufficiently recovered from his illness. Dimitrov might be a nuisance, of course – if he hasn’t overplayed and exhausted himself with all the mess-up in Sydney, but then 3rd round wouldn’t be til the end of the week anyway, and I’m sure all that conditioning he did with Rasheed will stand him in good stead. As always, draws have a habit of not working out as expected, so I’m taking it one match at a time. Yeah could be a tough grind tomorrow against Troicki. Be interesting to see if they give that half Tuesday start. Hoping for much better show from Roger compare to Brisbane form… Also hope he makes into second week still…As always one match at a time…Cheers..
Got lucky for first comment..
Yeah Berdych been pretty good in Aus recently, is it back to back semi finals? But Fed has the upper hand with him lately. In my opinion it’s one of the toughest draws for Roger in the last years. On paper, that is. Dolgopolov is a nuisance when his head is there – he even beat Djokovic almost, last year (before giving the last set away). I’m afraid a Seppi-like upset will happen again. But if he manages to reach the semis I definitely think he’ll beat Djokovic! Very slim chance Roger can beat Novak in 5 at ao. Only good thing is that it’s not the final where Novak really is unbeatable. Hopefully Roger plays freely. Honestly, getting to semis is more important. I think the draw is just well balanced, no gimme’s but not bad to have a few tests along the way as long as he’s not getting dragged into 4/5 setters first week. I quite like the draw. And if the last three Djokovic vs Federer Slam finals vis -a-vis Djokoivic-Federer semis are anything to go by, I’m quite happy with a Djokovic semi. But then again. One match at a time. Djoker near unbeatable on Plexi though. PlexiGOAT. Federer making the final and losing to Novak > losing to Novak in the semis. Did they put Fed in the top half on demand? Fedfans(including me) badly wanted it for a change. I too feel that Fed has more chances against HIM in semis than in the championship match. OOPS! One match at a time….!!! Very balanced draw, nice tune-up matches but no real threats before QF against Berdy/Clilic/Coric. From the other half, Wawrinka may make it to the finals, but he has to beat Nadal and Murray back to back. Stan seems to be the man on the circuit who has most chances of upsetting Mr. Unbeatable. That final could be interesting. But if Fed makes it to the final then obviously I want Murray. Yeah hope Stan has a good tournament, should be confident after Chennai. Biggest threat to Djoker on this surface. hmmm..tough draw indeed… But now, Im more concern on his health rather than Djokovic. Was only flu, should be over it by now. Does the time difference work out for you? Haha.i hope so..getting excited already..:) the time difference works for me.. Australia has 2 hours ahead of our time so i can watch it with no problem..
My office mate make fun of me coz I always say that he will win another grandslam..
anywayz… see him play makes me smile and be hopeful… :)yay! this is it! 😆 8am start slams. I’m sure players would like that. 8am is for me in the UK. That is 7pm is Australia time. ??? Brisbane was 10 hours ahead of the UK, wasn’t it? Surely Melbourne isn’t in a different time zone? Just checked the AO website, and it says you’re right. Good job I looked. Draw has a few tricky slope hope he will be battle harden for late stage. Can’t predict how the draw will go, sometimes it might open up for him. I think he will perform better than last year. Let’s do this Roger!!! Zverev gets a fair bit of hype. I’ve only seen bits of him. Interesting to see if he makes a big splash in next 3 years. Pretty young. Murray beat him easy in Hopman so prob same story in a more competitive match. Anyone who looks remotely like they might challenge at some point come in for fair share of hype. Funnily enough he was Junior AO champion, finalist at FO and SF at USO, & No1 ranked junior player, + one of youngest players to win on Challenger Tour, so he comes with some pedigree. And, Roger Federer is his role model. What more could you want 🙂 I quite like the way he plays, and his attitude. He walks straight to the other side during changeovers, no stopping. I like that. I think this is a good draw.Its fairly balanced and I feel there won’t be any upsets.The Berdych quarter is wide open and anyone can reach the quarters from that group.Fed avoided Nadal which is a good thing because it does play in fed’s head if Nadal is meeting him early.Last year Fed lost to seppi so anything can happen and therefore I don’t guarantee a semi spot but I am confident that he will reach semi here. 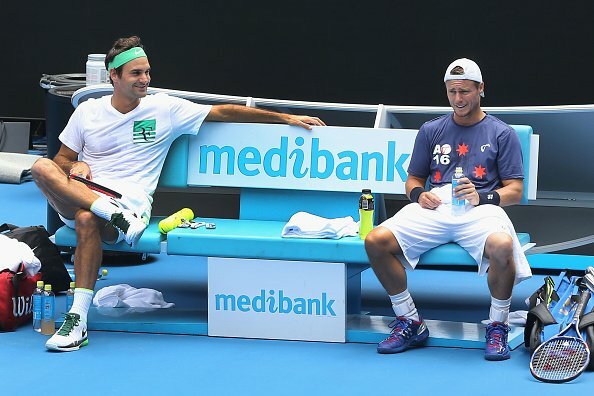 One match at a time and let the force be with roger and he has a memorable aus open. This is my first time on tiger mobiles challenge and I have made roger the champion. I just couldn’t make Djokovic win that match against roger in semis. Quite stupid but still I can’t make Djoker win the match. Haha I think most Fed fans do the same in their picks 🙂 I just make stupid ones so they both lose early. No tough decisions later on then. That Dolgopolov vs Duckworth final is looking pretty tasty. Better than Novak winning again. I did exactly the same in every tournament last year. I couldn’t make cincy predictions in time though. So this year I have chosen the most probable winner… Not for winning the iphone but for a change of fortune. Superstition.. may be. But this time I want to be wrong! Exactly what I did throughout 2015! Couldn’t pick ND to win a single tournament! Guess what, I was correct only once in guessing the winner, that was when Fed won Cincinnati. Sigh. No one on our league is going to win any prize unless Fed wins it all! I hope Roger meets Cilic in the QF. Unfinished business from USO 2014. What, does Djoko’s team pay off someone to ALWAYS get easy draws??? No easier than Federer’s really. Both quarters will probably open up too, only gotta look at how many players already looked injured 1 tournament into the year. How many men are injured? I only saw details about the women, whom I never watch. Non are serious but been a lot of withdrawals so far this year from matches – Sock today, Kyrgios, Monfils, and some others that I am forgetting all withdrawing from matches or mid way through. Most just precautionary but the heat in Melbourne will be a challenge. Jonathan have to disagree with you on Rogers Brisbane form. Definitely looked poor during the whole week. His groundstrokes were average compared to last years Brisbane tournament. I’m optimistic about ao because Roger was sick and still got to the final (so yes he obviously didn’t play horrendously). I’m saying Roger will fall to djoko in 3/4 but we’ll take it 1 match at a time. Brisbane is a warm-up and is not indicative of how he will perform in AO. Last year he won Brisbane only to flame out early at AO, while the year before that he lost the final in Brisbane but made it to the semis in Melbourne. (Last year he also played a lot of exhibitions without a real break during the winter and had to deal with Davis Cup, this year he’s better-rested). Better to peak for AO. Like you say, it’s a good sign that he made the Brisbane final even though his form was not razor-sharp. The Dimitrov match was key to test his mettle and ability to grind out a win despite playing poorly. Another week of practice and hopefully he’ll be right as rain for the rigors of Melbourne Park. Good point about peaking. Hope he can play himself into form and make the second week. He had flu and beat Dimitrov who played a good match and then schooled Thiem who a day earlier took out Cilic. I think he looked pretty good in Brisbane tbh. And agree with Steve, Brisbane not indicative of AO result. I like the draw too. Could make for some good matches on both sides. Obviously we must be a little careful with our expectations for Roger at this point, but I certainly believe he still has a chance here. Of course, it depends a lot on his form and the conditions. It will be interesting to see if Ljubicic has had an impact on his game. Haven’t seen any of Brisbane, so I don’t know. Still a bit early for Ljub to have an impact I think. He might have some impact tactically but in terms of minor improvements or whatever to his game, gonna take more time I think. Is there a H2H stat for Fed-Djoker in semi-finals and in finals? “Nadal to straight set Verdasco, I hope it’s like 2009 though” – meaning Verdasco plays like a madman but Nadal survives? No chance of an upset? Nah just the quality of match. One of my favourite matches that one, insane tie break from Fiasco. Can’t see him upsetting him, goes on too many walkabouts over 5 sets. That match destroyed Verdasco. Don’t see the hype, Rafa in 3. Not really he had his best year on tour in 09 and made the World Tour Finals. Past that though, Verdasco is one of the most talented players on tour and that one match cost him a lot mentally moving forward. Nope, that match actually had zero impact for him mentally, if anything it was the reverse and it proved he could compete with the best. He kicked on after that loss. 2009 was his best ever year. 2008 off season he worked with Gil Reyes, got himself in great shape – AO semi finals, 4th round French, 4th Round Wimbledon QF US Open. Career high ranking of 7 and made the World Tour Finals. He did pretty well in 2010 too. 4 out of 6 ATP titles came after that semi final. Why is everybody talking about Fed-Novak semi? Am I only one who don’t wish the match-up to happen in slow hard court any more, especially AO? Yuck! Which surface do you want it on? There aren’t many to choose from. Hello, all! Long time no see. I wanted Federer and Djokovic to be in opposite halves of the draw. It may be true that Federer has a better chance against Djokovic in the semis than in the final because he feels less pressure (then again, it may not be true), but if Federer can’t beat the best in the biggest matches he doesn’t deserve the title. If he’s become so gun-shy that he truly cannot play his best tennis on the second Sunday, when he really needs it, then he’s not likely to win another Grand Slam. No one is going to hand it to him, not even Murray (who’s desperate to win this title and wipe out a perfect record of four defeats in four finals). Sampras was fortunate to get a soft draw and an exhausted Agassi in the final for his last Grand Slam run. Federer won’t be so lucky. There’s no such thing as a soft draw anymore, and given that there are three younger multi-Slam champs in the field, he’ll almost always have to go through two of the Nad/Djoko/Murray troika in the semis and final, a nearly impossible assignment. And if Federer gets through Djokovic only to face Nadal in the final, what will you say about his chances then? Unless he’s playing absolutely perfect tennis on the day, it’s going to be very tough. There’s nothing much to say about the early rounds, as they’re a complete crapshoot. His early-round upsets or near-upsets in Grand Slams were all out of the blue. Dolgopolov is an enigma, he could blow red-hot or ice-cold, but over five sets I give the edge to Federer, since he’s the steadier player overall and has a more consistent serve. The second half of the tournament is when he starts facing better-known players and the matchups become more predictable. Just hope he can get through to week two without any hiccups. Then we can think about his winning the title. A Federer Nadal 2009 rematch. Ouch. Not sure I would want to watch! I don’t recognize that purple shirt Roger is wearing? I do occasionally have the courage to pick Djokovic for the win. Mind over emotion…hard to do. I see all draws a crap shoot. Impossible to guess some of these matches. The draw looks pretty even though Murray’s looks the easiest. Maybe I’ll pick him for the win, lol. That shirt was Ao 2009. Epic tournament (only to lose it in 5 against Nadal ?) but that kit is definitely one of my favourite of Rogers. Purple shirt? Where is this? Jonathan, in this post the 1st photo…the shirt looks purple. I know AO 09 was a dark blue and Roger had a horrible hair cut. (That’s why he lost btw). Most balanced slam draw in a while. Seems like old times with Djoker/Fed and Rafa/Murray sharing the halves. Here we go again with the talk about Fed having more chances against Novak in the semis. Not sure what the logic behind that is but Djoker is near unbeatable on this surface let alone the past year too. Hope Fed is getting back to his best fitness wise and slowly plays himself into form and get back into the quarters. Will try keep you guys updated from the happenings around Melbourne Park. Cool, do you have Monday night sessions tickets? Looking forward to your reports, Alysha! Wonder if Conal will be there. Conal has been ball boying in Sydney so not sure. No wonder he hasn’t uploaded any Fed videos, hah. If Nadal gets a Murray walkover (for his baby’s birth), that’s going to be a bit annoying. All this talk about leaving for the birth is just good PR from his team. She isn’t due till late February. Night session start for the Fed-meister. Works for me. He should have just laughed it off. Best was then they said Fed was Number 1 in the world in that trophy presentation. Was I one of them, Johnathan? Can’t see the picture, but it *is* pretty poor if it’s from the AO, and they can’t even spell a world No. 1 and multiple slam champion’s name properly. After all, would we be complaining if they’d written “Rodger”? Agree! As long as no power play opposition before QF, Fed into 2nd week! Watched Grigor final this morning and he still has those demons at the worse moments! I hv called exactly the same as you!! Muzz has an absolute cakewalk! The rest?? It’s a mystery!!? It was a good match the Sydney final. Is Dimitrov’s stock rising? Troicki not the strongest player in the mental department either so should probably be beating him. But they both saved some big match points. Who is RCB? Royal Challengers Bangalore? 😆 You picking Busta or Agut to take out Kyrgios? Yeah could tell he has a cold. Few more days rest though and should be fine. Hope he hasn’t asked Cilic for advice on how to shake it. Decent draw for Roger. Hope he makes the semis. Don’t see anything that can stop Djoker from winning it all again. I just hope he doesn’t win every thing this year. It’s just very easy these days for Djokovic, with the swiss being the only ones with any chance of beating him. The older Roger gets, the more impossible that gets. Can one of the new guys live up to their potential and break through? Can Roger please deliver one more slam wins? Seems impossible, but I just hope it happens somehow somewhere. Who would have predicted Djoker not winning the French though? 🙂 Anything can happen. about 2-3 games before finish, the seat next to player entrance is already full with people. Security already blocked that section. The one that can pass through is only the one that is actually sit on that section (and you have to show the seat ticket to the security). My suggestion, check the daily training schedule (download the AO apps on your mobile and get it from there). get to the Rod Laver Arena early morning (I went there 1 hour before the gate open, crazy people like me already queue as well). Once it is open, run to the training court (seriously run, by 15 minutes standing place on Federer training court is already full). Take the standing place instead of the seat. Even after all of this there is a 50:50 persen chance, usually Federer only come to one side of the court, the other side of the net will not get it. If you come with your friend, ensure you are on different side of the net so one of you can get the signature for both. I got autographs from Murray, Nishikori, Nadal, Fognini on practice courts from the last 2 years. I hope I can get lucky this time! I can send you a Federer autograph if you want, replica done by me. Would take a handwriting expert to spot it’s a fake. I have only two of note – Kevin Keegan out shopping when I was a kid and Sir Geoffrey Boycott from a ODI at Headingley. What a legend. Did anyone see the new commercial video roger posted on his Facebook page. Roger federer caught the helicopter in time? . Just watched it now. Sunrise doing a fair bit with him. Sorry a bit out of topic, I would like to ask how to get wimbledon ticket. Seems so complicated when I look into it on the website. Can I send you email to ask about this? 1. Overseas Ballot – which I think you will have missed the deadline for. Luck of the draw of course with this. 2. Camp Out – You camp in Wimbledon park overnight – you will need to arrive the morning before the days play you want tickets so if you want 2nd Round Wednesday Tickets for Centre Court – arrive Tuesday Morning – you get given a queue card with a number on it which is your place in the queue, 500 tickets for Centre Court available usually so if your queue card number is between 1-500 you’ll get centre, 500 to 1000 I think is Court 1. Might be slightly more. 3. Ticketmaster – Tickets go on sale each day for the next days play at various times. Two slots per day I think – one for returns and the other for general sale. Very limited availability. 4. Resale Sites like Viagogo – Be prepared to pay big bucks. Five if Roger’s playing late on: get there early enough to get in on a ground pass, go straight to the ticket resale area and hope that someone returns a ticket sometime after 5 pm, which I think is the earliest they sell them? Any idea how many for ballot, how many for ticketmaster? If camp out got 1000 seat (500 for CC), there will be more than 14000 tickets for ballot and ticketmaster combined right? Seems like even if you have money to buy the ticket, it is almost impossible to get it. And to get the ticket for wednesday, you have to camp out from tuesday morning? This is incredible. Which time in the morning? Isn’t there still the queue for the one that going for tuesday there? Ok, so someone answer my question. In the 1st photo of this post…when is this? Purple shirt? It’s blue. Australian Open 2009. Laptop, Tablet, Phone, Desktop – looks blue on every device. I looked at other photos of AO 2009…definitely is blue. No idea why this one looks purple on my pc…..must be losing it. I installed f.lux. Check it out…love it. No hidden catch. Looks purpley-blue on my laptop, too, (more like WTF final from 2012?) and I’ve got f.lux installed. It’s so funny how many Djokovic fans try to twist everything Federer says to suit their narrative that he tries to undercut Novak all the time. Apparently some of Roger’s comments about Novak’s 2015 season and how he said Stan shouldn’t be forgotten about because he won the French has got them really irked. So Nishikori got through Kohlschreiber comfortably. Could have been a tricky match. Chung has impressed me a lot vs Djokovic. He definitely looks like someone to watch out for the next few years if he can polish his game. Too bad Dr. Ivo retired but he wouldn’t really trouble Novak that much unless he served the best match of his life.